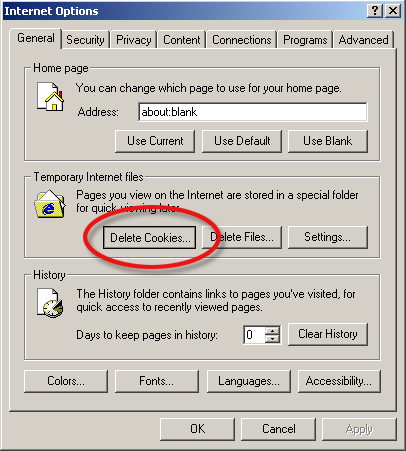 Please note: Unfortunately Internet Explorer does not allow you to easily delete individual Cookies. Because of this, instructions for deleting all Cookies have been provided below. Alternatively, you may want to try using Firefox or Safari which do not have the same limitations with regard to deleting cookies; and are also nice browsers. Deleting all your Cookies may require you to re-enter information such as login information for e-commerce sites such as retailers, and banks. 1 Please launch Internet Explorer and click on the "Tools" button on the top right hand side of the window. From there, select "Internet Options". From this window, locate the section labeled "Temporary Internet files" and click on the "Delete Cookies..." button. Please click on "OK" to delete your cookies and exit. 4 Try to login to your account.